» Let's post at the most random times possible! Three in fact so, thought you guys could help me choose! Try this if you do not have a clue where HTML is involved. I just gave this idea a thought and wondered if we possibly should change Sonic Forever into a forum involving more than just the Sonic franchise. For example, having the forum changed into a forum about Nintendo, SEGA, MLP, and anything else we'd have in mind for it. Ultimately it would be up to Tres on this situation but at least lets get some thoughts on this topic. Just doing some shuffling of some of the topics. The off-Topic forum is now the Recreational Area. For fun topic/games/random/anything. And the Movies and TV topics have been combined. Welcome everypony to Sonic Forever's new design. Although this design is only in it's beta form, it will not matter anyways because this is APRIL FOOLS everypony! 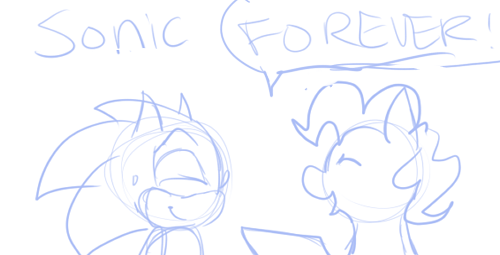 For the next two days as I work on Sonic Forever's actual design, you will have to gaze into the creation that Tres has running through his mind. Enjoy! As you may already know, there have been quite a few changes done to the site. I hope do go through more to improve the site appearance and such. The skin - A lot of people seem to like the premade skin but I think we should customize it a bit.